Divide the papaya in half and shred into strips. Mix 2 tablespoons coarse salt with shredded papaya. 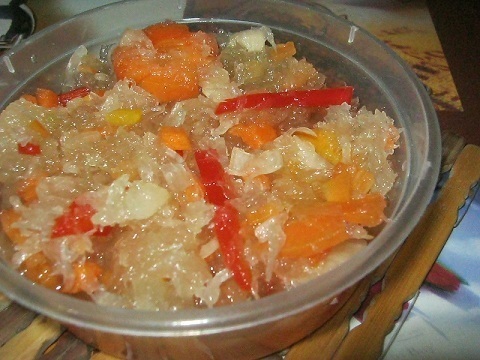 Mash and squeeze shredded papaya to extract juice. Add remaining rock salt as neede. Discard papaya juice. Place squeezed papaya on a clean cheesecloth. Squeeze papaya strips through cheesecloth. Set aside in a bowl. Put vinegar and the 2 kinds of sugar in a saucepan and let boil for 5 to 7 minutes. Add more sugar to sweeten to taste, if desired. Do not stir. Add papaya, carrots, red bell pepper, garlic, ginger and shallots to the vinegar sugar mixture. Allow to boil 2 to 3 minutes. Transfer achara into sterilized bottles. Let cool before covering. Note: You may alaso use cookie cutters to cut the vegetables into decorative pieces. End.